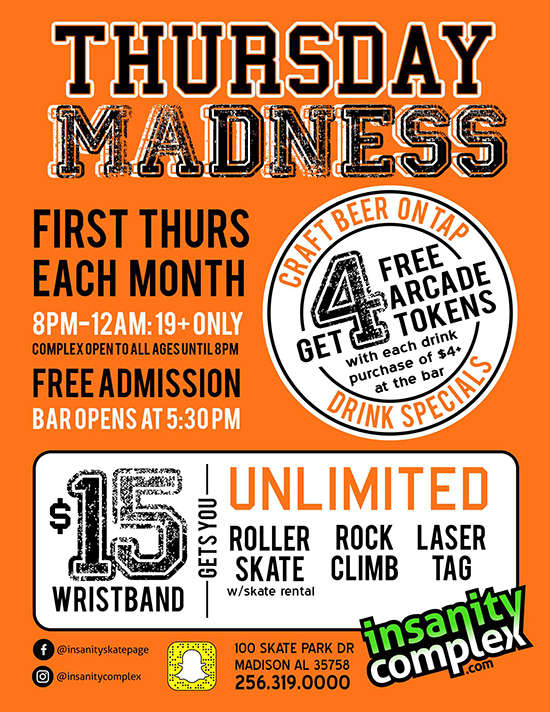 CALLING ALL 19+… THURSDAY MADNESS is back! Same time, same place. FIRST THURSDAY OF EVERY MONTH!! Bar opens up at 5:30, so come hang out after work and grab a drink. 19+ ONLY AFTER 8PM and we’re rolling until midnight! Drink Specials + craft beer + food specials +$15 wristband gets you UNLIMITED Roller Skating, Rock Wall & Laser Tag= one good time!